The Castelli Romani or ‘Roman Castles,’ is the name used for the towns located southeast of Rome’s countryside, immersed in the natural park of the Lazio region. Generally less frequented by tourists, the area is perfect for those looking to escape from the city while exploring the traditions and culinary-gastronomic offerings of the area. Lanuvio has its origins in the 9th century BC and the historic center is still surrounded by walls, hiding a series of houses, buildings and churches. Walking through the streets and alleys, visitors can reach the 14th-century fortress with its two striking cylindrical towers. Originally a prison, it is now the municipal wine shop, where guests can taste the fine wines ‘Doc Colli Lanugini’ and visit the fascinating exhibition about agricultural and winemaking tools. Make time to visit some of the monuments, such as the 15th-century baronial mansion and the nearby fountain, built by Carlo Fontana del 1675; the Collegiate Church of Santa Maria Maggiore of Medieval Foundation; the Loreto Bridge and the Church of Madonna Delle Grazie, dating back to the 16th century. Lanuvio’s Festival of Music is an annual event where local bands perform all over the tiny roads of the city. Genzano di Roma is a town rich in historical and artistic heritage, including the 18th-century palazzo Sforza Cesarini, the Capuchin Church of the 17th century and the Church of the Holy Trinity. The three main streets, called il tridente di Bacco, depart from the main square leading to Lake Nemi and to the Church of Santa Maria Della Cima. During the Corpus Christi festivities, one street is fully covered by a floral carpet of about 2,000 square meters, whose artistic composition is part of an ancient tradition of floral display. Ariccia is considered an artistic treasure of this area and home to one of the finest architectural examples of the European Baroque, largely designed by Gian Lorenzo Bernini and Carlo Fontana. The monumental ensemble of ‘Piazza di Corte.’ The complex includes the Chigi Palace – richly decorated with lounges, precious original furniture and walls covered with original leather ornaments – the extensive surrounding park, and the Church of Santa Maria Assunta, inspired by the Pantheon in Rome. Two other religious complexes are surely worth a visit. The sanctuary of Santa Maria di Galloro and the Deconsecrated Church of San Nicola. The city is also famous for its monumental bridge, built under Pope Pius IX. Foodies will love Ariccia for its fraschette, the typical local restaurants where you can taste the delicious porchetta, the Romanella wine and the homemade pasta. Albano stands on the volcanic Alban hills, and it is located next to a lake, which it shares with the nearby Castel Gandolfo. The majestic baroque Cathedral of San Pancrazio, the circular-shaped romanesque church of Santa Maria Della Rotonda, the porta Pretoria, the ‘Cisternone’, an underground warehouse built by Septimius Severus and still used for the water supply of the city, the Roman amphitheater, and the tomb of the Orazi and Curiazi are just a few of the legendary historical offerings of the city. Another stop on this tour is surely Castel Gandolfo, overlooking Lake Albano and holiday destination of popes, cardinals and prelates of the Roman Curia. Several significant monuments are located in the town, such as the Church of San Tommaso da Villanova, created by Gian Lorenzo Bernini, the 16th-century porta Romana, the majestic villa Clodius and the ancient villas connected to the Papal Palace. Marino is well known to wine lovers, due to its abundant grapes growing in extended vineyards. During the famous annual Grapes’ Festival (also called Wine’s Festival), the water of the baroque fountains of the city’s main squares is replaced by wine, creating a goliardic atmosphere. Marino’s most beautiful monuments are the baroque church of St. Barnabas and the City Hall, which used to be the residence palace of the wealthy Colonna family. Although very small, Nemi is probably one of the prettiest towns in the area. Mainly characterized by tiny roads and small rocky houses, it’s famous for being the city of wild strawberries, as many grow in the area. The local bars offer a variety of drinks and delicacies made out from the fruit, like the famous Fragolino liquor. It goes without saying that the most anticipated event is the annual Festival of Wild Strawberries. 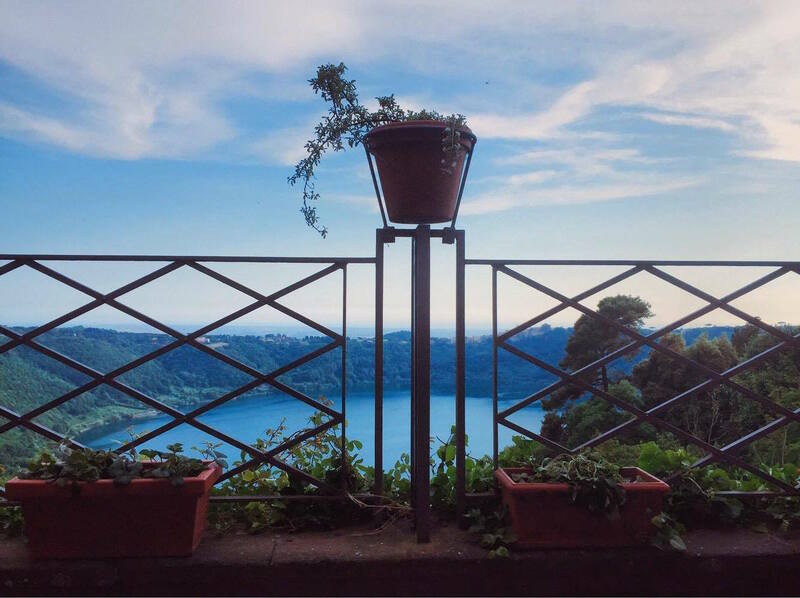 Nemi is nestled on a green hill exposed on a tiny volcanic lake. Even though individuals are not allowed to swim in it, the view over the crater is breathtaking. One of the liveliest cities in the area, Frascati has a lot to offer in terms of nightlife. Many bars and restaurants attract the youngest generations of the area. The so-called ‘Bar of the Mirrors’ in the city center guarantees visitors a singular experience while drinking their coffee. The walls are, indeed, decorated with several mirrors that vary in shape and size. Visitors’ reflections will also be transformed. Frascati is the only city of the area, together with Albano Laziale, which is directly connected to Rome through a regional train.